“Cartouche” Award: A highlight of our meeting is the recognition of an exceptional period furniture maker with the awarding of the Cartouche, the SAP FM’s annual award for lifetime achievement. The Cartouche is a bronze casting off a carving by SAPFM member Gene Landon of an 18th century Philadelphia cartouche of a Joseph Ellicott clock. This year the Executive Council is excited to announce that John McAlister of Charlotte, North Carolina will receive the award. John has been working wood as an amateur for almost 35 years, most of it satisfying his passion for building 18th century American period furniture. He is a self-taught, consummate craftsperson whose introduction to furniture making was Marlow’s Fine Furniture for the Amateur Cabinetmaker. John made all the pieces in the book. In fact, no period piece has ever intimidated John, but that is to be expected from this former fighter pilot who flew P-51’s during WW II. His home is filled with his work including his masterpiece Goddard-Townsend secretary. This piece was featured on the back cover of the April 1998 Fine Woodworking. Like many period furniture makers who started before woodworking magazines appeared, John has visited countless museums inspecting and measuring pieces of furniture that he later recreated in his basement workshop. John embodies a special dedication to our craft and has always been willing to share his plans, research, and knowledge with fellow woodworkers. Jeffrey Greene thanked John on the title page of his book American Furniture of the 18th Century for his suggestions and encouragement. Numerous testimonials were received during the Cartouche selection process on John’s behalf thanking him for his help. 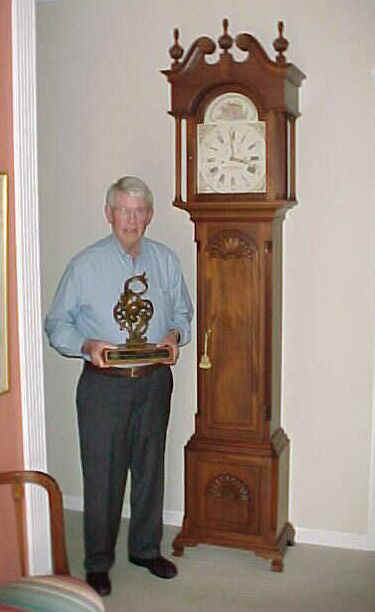 The Society of American Period Furniture Makers is honored to award gentleman and cabinetmaker, John McAlister with this year’s Cartouche Award.